Product code: W1489cc Categories: Sold Items, Sold Omega Watches. 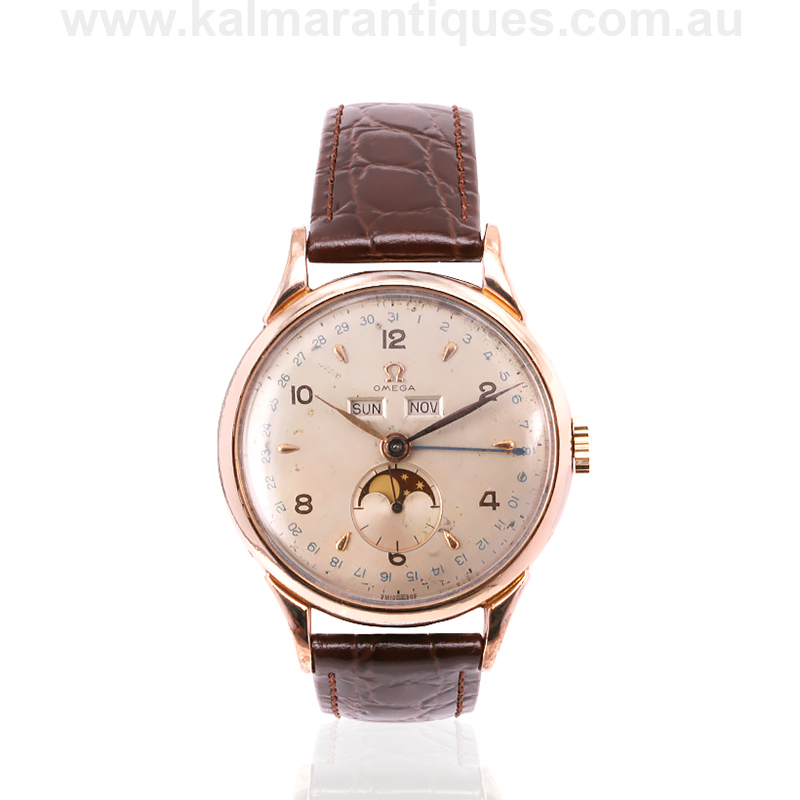 Here is a very rare and highly collectable vintage Omega Cosmic Moonphase watch from 1947, reference 2486-2 that not only looks amazing on the wrist, but has aged beautifully. First made by Omega in 1947, the exact year that this one was produced, the Omega Cosmic Moonphase as it was officially named by Omega, was made until 1956 and should not be confused with the Omega Cosmic range of watches of the 1970’s. The case itself is a 80 micron 14 carat gold plated case which is still in incredible condition even after all these years. Most gold plating is usually anywhere between 10 to 20 microns, so being 80 microns this explains why it is still in superb condition. 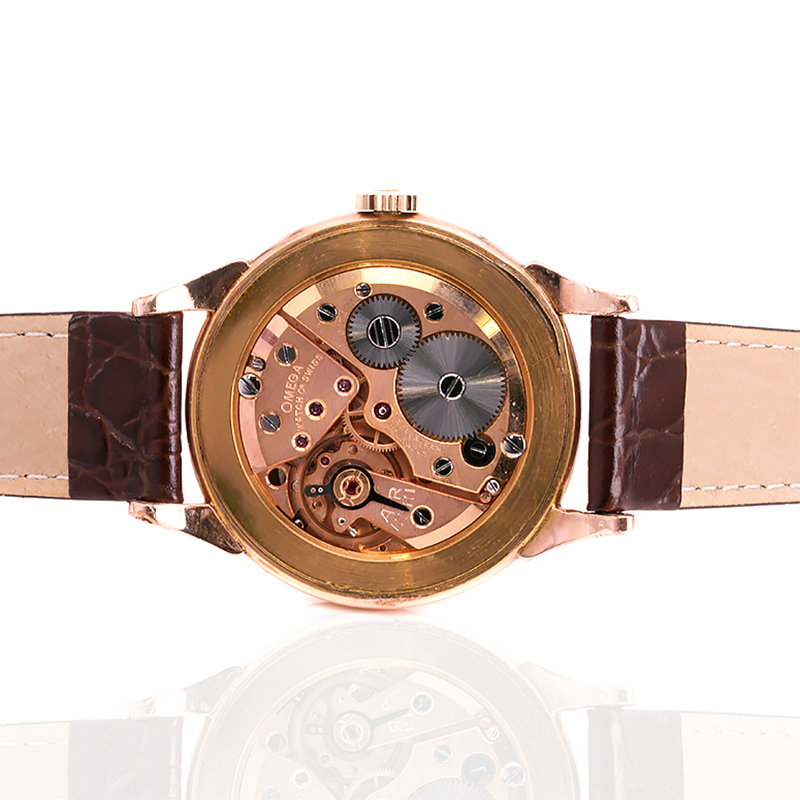 The colour has a lovely warm rose colour to it that looks even better with the dial which has aged so beautifully. Not only displaying the time, it is also a triple date meaning that it can be set to display the day, and month which can be seen just under the Omega logo, and also the date which can be seen on the outer edge of the dial. And on top of this, it also has of course the moonphase function which gives it such a stylish look to it. The dial has that wonderful patina that actually accentuates the watch and looks better than similar models that have had the dials repainted. Inside is the beautiful 17 jewelled manual wind calibre 27 DL PC. This is a somewhat unusual calibre reference which was re-named the following year in 1948 to the calibre 381. AM). 27 stood for the size of the movement at 27mm in diameter (and 5.25mm thick) and DL stood for triple date and moonphase, and the PC stood for the shock absorber used. This is a highly collectable vintage Omega watch that not only has a dial that is gorgeous to admire but looks spectacular on the wrist.